Lost in Luxembourg 3 2013. Report and pictures. Gallery of Chris Webber's photos. Gallery of Martin Halliwell's photos. Gallery of Hugh Mackenzie's photos. 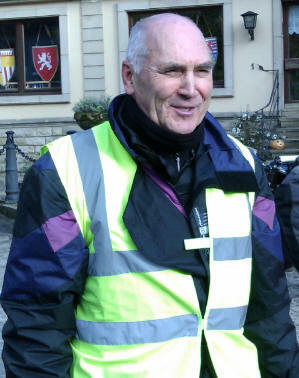 In my absence Chris Webber took my place as 'organiser' for the 'Lost in Luxembourg' tour, for which I am very grateful. 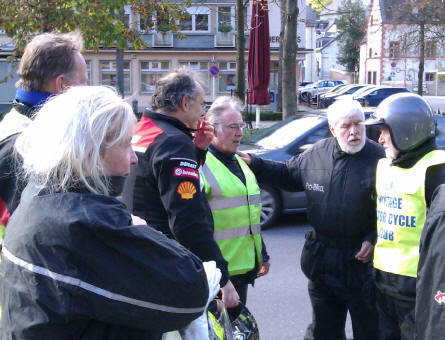 The tour went smoothly and the riders enjoyed three days of good weather out of four. There were a number of Routes Barrées along the way. These occur where the local authorities close the road for repairs. In some cases they dig out the entire road from pavement to pavement, to a depth of a metre or more along a stretch that might measure a hundred metres or more. The general advice is to ignore the signs - especially on the weekend when nobody will be working - and try to navigate through to the other end. In the week it is often not possible to do this and the road workers will make it clear that they are not going to permit you to pass through the roadworks. The only alternative is to follow your nose or get your map out to find a way around the obstruction. In some locations this can entail quite a lengthy detour (hence the initial attempt to get through the roadworks if possible). 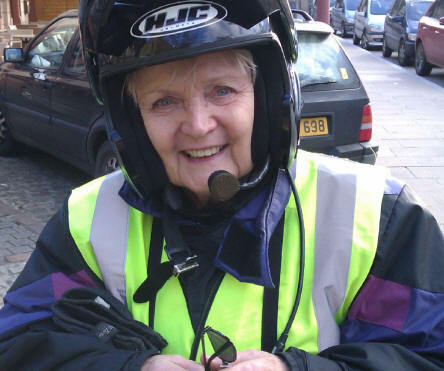 Chris has sent me a set of photos and, unusually, they are of people rather than motorcycles. They make a very welcome change and it is good to see so many familiar faces. 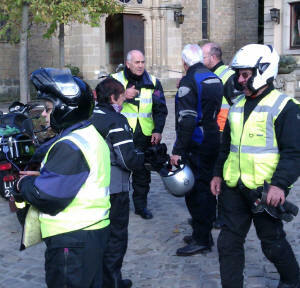 All the riders that you see here have been to Luxembourg on at least one previous occasion and some have been many times and rate it as one of their favourite rides. A happy group enjoy some light-hearted banter. From the left: Hugh Mackenzie, part hidden by Ruth Francis, Martin Halliwell, Malcolm Graham, Dave Benson (talking) and Bill Mills. 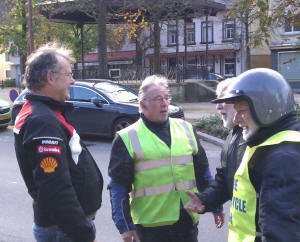 In Larochette, Martin Halliwell, Malcolm Graham, Dave Benson (talking) and Bill Mills. Dave Fox again with his Velo. 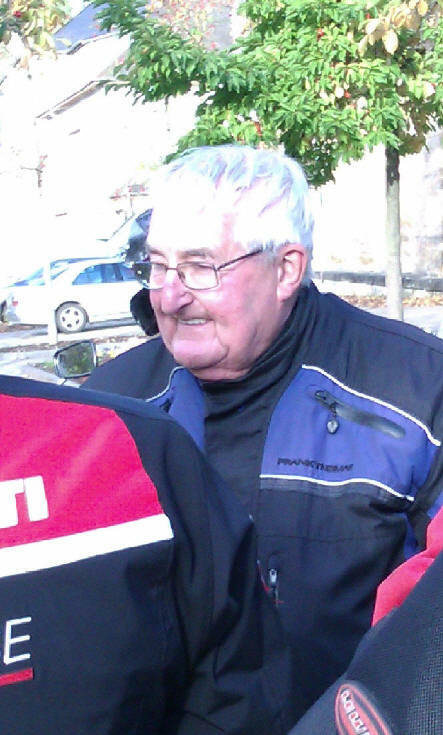 Dave Bourne, riding with us again after a break of two or three years. Duncan Moss - the pose tells you all you need to know, Yvonne Banfield and Murray Freeman. 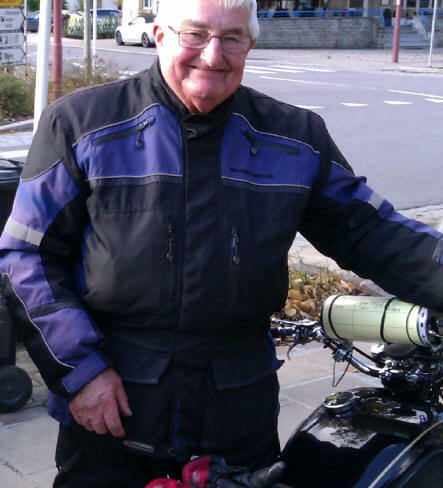 Our host in Luxembourg, ex-pat Martin Halliwell invited the entire party to his home for a BBQ. 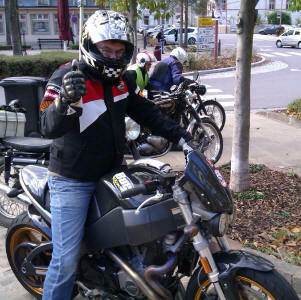 He then led the group to Larochette and is seen here about to depart for home aboard his Buell. Eve Bourne, back with us again.